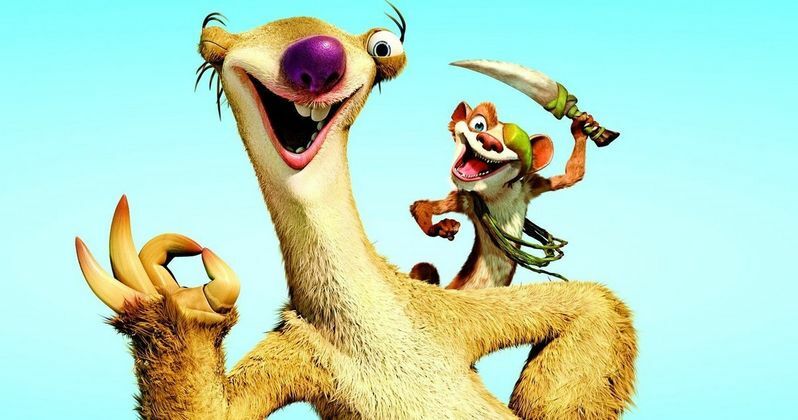 Raise your hand if you're excited for Ice Age 5. Well, we've got some good news for you! The 20th Century Fox and Blue Sky Studios sequel has been given an official title and a new release date. Now known as Ice Age: Collision Course, this animated adventure will be moving from July 15, 2016 to July 22. This will ensure it's safe passage through the movie theaters of America! What had 20th Century Fox and Blue Sky Studios scared enough to move it's big tentpole animated release by a week? Ghosts, which they are definitely afraid of. On July 15, Sony will finally be releasing it's Ghostbusters reboot. The title is certainly appealing to children and adults alike. Though director Paul Feig, who has made some of the top grossing R rated comedies of this past decade, has made it clear that this will be a lot more scary than the original 1984 Ghostbusters. And a little raunchier, too. Very young children need not apply. The date change now pushes Ice Age: Collision Course up alongside Knights of the Round Table, which stars Charlie Hunnam. Being a Guy Ritchie movie, we can expect this sword in the stone tale to be a little more violent and adult, harkening back to 1981 R rated adventure Excalibur. Though, it will surely get a PG-13 rating to ensure the widest possible audience. 20th Century Fox and Blue Sky Studios have not revealed any plot details for Ice Age: Collision Course, but we can make a lot of guesses off that new title alone. The main voice cast is returning, with Sid, Manny, Diego and Ellie once again being voiced by John Leguizamo, Denis Leary, Ray Romano and Queen Latifah. New cast additions include Keke Palmer, Wanda Sykes and retired talk show host Jay Leno. No further character announcements have been made. The franchise first kicked off in 2002 with the original Ice Age. It has since spawned three sequels aside from Ice Age: Collision Course. They include 2006's Ice Age: The Meltdown, 2009's Ice Age: Dawn of the Dinosaurs and 2012's Ice Age: Continental Drift. It's unclear how many more sequels are planned for these should-be extinct animals. So far, the series has pulled in a cumulative gross of $729.6 million in the states and $2.8 million worldwide. The last two installments have grossed over $850 million worldwide. With the gap between movies even longer this time, audiences will surely flock to Ice Age: Collision Course to visit with their old friends yet again, insuring another blockbuster outing.